After reading forum threads on pot grippers I decided to get my old MSR gripper out, and start thinking about how to make it lighter without loosing stability. The original version weighs about 45 grams (1,6 oz). The Trangia version is 48 grams (1,7 oz). A new MRS gripper, the Litelifter™ weighs 28 grams (1 oz) according to their website. Improvement of the old MSR gripper: I started with filing off the rivets that holds the two pieces together. Then I filed off unnecessary material around the edges of each piece, and mad the holes larger where the stress would be lower. I was careful at the front of the gripper, near the axle, where the stress is high when a heavy pot is lifted or tilted. The advantage of using a file for the holes is that you can shape them in any way you like to optimize the strength to weight ratio. I also shortened the gripper from about 125 mm (4,9 in) to 112 mm (4,4 in). The rivets where replaced with a small screw and nut. After a few sessions with filing and testing I got the weight down to 31 grams (). I could not notice any problems, even with heavier loads. I started to suspect that the design is very over-dimensioned, at least for use with smaller pots. New pot gripper prototype: Next step is to build a new gripper from scratch in a thinner material. The original's material thickness was 2 millimeters (0,08 in). I chose a 1 millimeter (0,04 in) sheet of aluminium/aluminum for the new version. I also made the new version a little shorter and narrower. The new length: 105 mm (4,1 in). The length can be shortened more or less depending on how the gripper is used. I eat from my pot, and hold it with the gripper during a meal (or while it's still hot), so I need a good comfortable length. 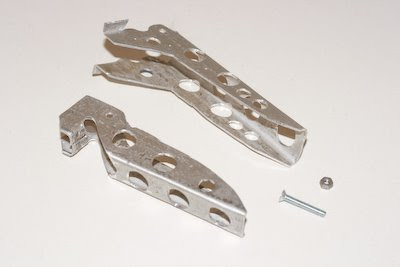 The width of the handle of the old MSR gripper was 24 mm (0,9 in) and the the new version is 18 millimeters (0,7 in) wide (not including side supports at the front). The parts after some cutting, shaping, drilling, and filing. Weight: 18 grams (0,6 oz). The new ligher pot gripper prototype. Weight: 16 grams (0,56 oz). Result: The new pot gripper weighs 16 grams (0,56 oz), and is very stable for both lifting a full pot, and tilting it (to pour contents). It's also comfortable to hold a pot while eating from it. I did not notice any problems for pots from 1-2 liters, even when full to the rim. It may be too weak for larger loads, but I have no pots to test with, and no need for that kind of strength. Conclusions: The traditional Trangia and MSR pot grippers are over-dimensioned and too heavy. The clever design will be strong enough with thinner material, at least for use with smaller pots. 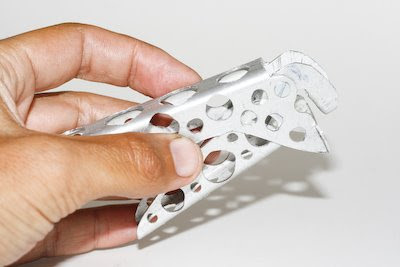 It would be interesting to try this design with even thinner material in titanium. Efter att ha läst intressanta forumtrådar om tamojer (de där handtagen som man greppar kastruller med ute i vildmarken) bestämde jag mig för att plocka fram min MSR-tamoj och fundera på förbättringar. Den ursprungliga versionen (som följde med MSR:s kokkärl tidigare) väger ca 45 gram. Trangias väger tydligen 48 gram. En ny MRS-variant (Litelifter™) väger 28 gram enligt deras egen hemsida. Förbättring av befintlig MSR-tamoj: Jag började med att fila bort nitarna som håller ihop de två delarna och började sedan fila upp hålen i respektive del där det verkade vara onödigt mycket material. Jag filade också bort en del av profilens höjd eftersom delarna upplevdes som extremt styva. Försiktigare var jag längst fram där man greppar kastrullen där krafterna bör vara som störst. Fördelen med att fila upp hålen i stället för att bara borra är att man kan forma hålen så att viktbesparingen blir optimal. Nitarna ersatte jag med en liten tunn skruv med tillhörande mutter. Efter några omgångar av filande och testande hamnade MSR-tamojen på 31 gram, och funktionen var så gott som opåverkad även med tungkastrull. Jag började misstänka att kontruktionen är kraftigt överdimentionerad. Åtminstone för mindre kastruller/mindre vikt. Ny tamojprototyp: Nästa steg blev att bygga en helt ny tamoj från scratch i en tunnare godstjocklek. En mätning visade att MSR-tamojen var tillverkad av 2-millimeters aluminiumplåt. Jag gissade på att en millimetersplåt skulle kunna räcka. Det vore i alla fall spännande att se hur en sådan skulle fungera. Jag passade också på att korta ned designen och göra den smalare. MSR-tamojen var ca 120-130 mm lång från början. Jag kortade den sedan till 112 mm (överdelen). Underdelen kortades ännu mer. Den nya blev 105 mm lång, men kan säkert kortas ytterligare beroende på hur man använder sin tamoj (att hålla en full kastrull för att äta ur den kräver en viss längd för att göra det bekvämt). Bredden på MSR-tamojen är 24 mm, exklusive stödvingarna längst fram. Den nya lättviktstamojen blir 18 mm bred. De två plåtämnena har fått form och flera hål för att få ned vikten. Vikt: ca 18 gram. Ihopmonterad och måttligt lättad tamojprototyp. Vikt: 16 gram. Resultat: Den nya tamojen väger 16 gram, och är så gott som lika stabil som MSR-tamojen i höjd- och sidled (med 1-2 liter). Funkar utmärkt att hålla i kastrullen då man äter en stor måltid ur den, eller då man häller vätska ur en full kastrull. Det kan hända att den blir vinglig/vek vid stora kastruller (3 liter eller mer). Jag har ingen kastrull att testa med nu. Slutsats: De vanliga tamojerna är överdimensionerade. Åtminstone för de mindre kastrullerna. Det vore intressant att testa denna design (eller liknande) med ännu tunnare plåt i titan. Det skulle inte förvåna mig om man kan få till en stabil titan-tamoj som väger under tio gram. The mountain station Glitterheim is still closed when I leave in the morning, but there are two climbers at the parking 8 km down the road. They're going for a tour to some summits east of Glittertind that includes glacier travel with ropes. I meet two more cars before reaching Randsverk. They're probably going for day and weekend trips from Glitterheim or the Glitterheim parking. After Randsverk I chose the road into Murudalen. A man explains how I should get to the small road that could take me through to highway 255. There will be gravel roads up into the mountains again, but not higher than around 1000 meters. There are few signs, and few people to ask. When I find the first intersection I hesitate. The road climbs steeply up a mountain side, and the gravel is very loose and dry. I check for alternatives, but there is no other way according to my map. I hang around in the corner for a while before another man arrives. He suggests another alternative that isn't on the map. He claims there is a "tractor trail" through the forest all the way to the other end of the valley. He says he cycled it himself a few weeks back, and only had to get off the bike "a few times". I give it a try. How bad can it be? 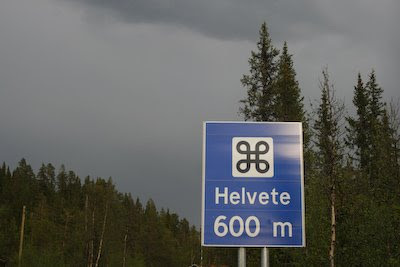 Helvete is the Swedish and Norwegian word for hell. It can be bad. Very bad indeed. The road is paved at first. Then a good gravel road for a few miles. 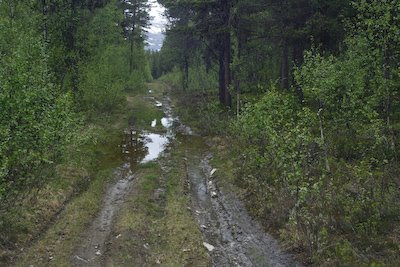 Then a wet and muddy track in the forest for mile after mile, and it gets worse. I have to get off the bike constantly to push it through mud and deep water. At some points the whole road is covered with a foot of loose mud and water. What if this is not the right track? There were a few options earlier. I start to suspect the worst - that all this work will be of no value if this is just a dead end in the forest. I could see tracks from a bike before, but where is it now? Just when I'm ready to give up and go back I see a slight improvement of the "road". It gives me enough hope to continue. 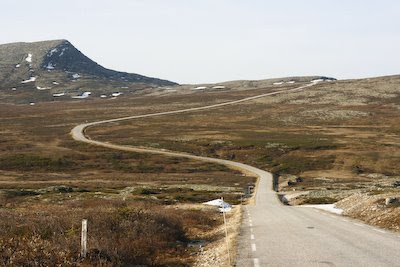 The "road" between Murudalen and Skåbu. Further ahead I find some signs of civilization; Old farm houses in the forest and some sheep in a small field. I've made it to the other side, but wasted a lot of time. I ride along highway 255 until it's time to camp in the evening. I find a good place near the road at Nedre Svatsum. 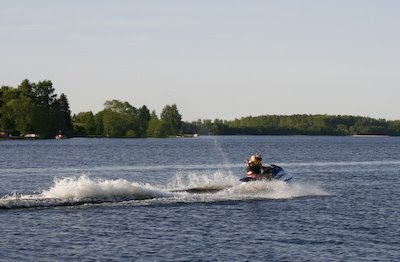 On Sunday I cycle along lake Mjösa during a large part of the day, and then on highway 24 and highway 2 in the evening. I cycle through Kongsvinger, and then takes the small roads toward the Swedish border at Mittandersfors. 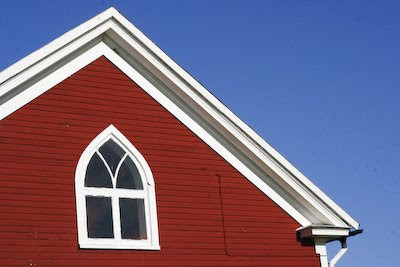 The church in Gräsmark is very pretty. I also stop at Selma Lagerlöfs estate Mårbacka. I have good tailwinds most of the day. Örebro is not great for cyclists. First you have to cycle on a fast "2+1 road" with a wire and a lot of traffic nearby, and then bikes are prohibited. The bike lane leads off to a dead end at a recycling station, and no signs show how to get to the center. It gets better closer to the town center, but there are only signs for places inside the town itself - not to other towns or villages nearby. I camp near Hampetorp, and there is some rain during the night. 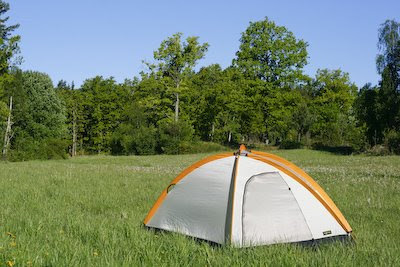 There is some rain showers in the morning so I stay in comfort of my tent for a while. The wind is still helpful during the day. I eat pizza in Sparreholm, and arrive in Trosa in the evening. Being all alone at a large mountain station far from civilization is a nice, but very special feeling. I decide to have a relaxing day with photo sessions near the tent and short walks in the valley. I try to cross the brook near the station, but the bridge is removed and there is plenty of water. There are waterfalls and a large snow bridge higher up on the mountain side, but that might be a dangerous crossing. I take some photos of the Spring Pasque flowers (Pulsatilla vernalis) and the mountains. After a while I get bored and put my ski boots and skis on. I climb the snow fields near Glitterheim and cross the snow bridge where it looks thick enough, but above the steepest section where I would be dragged over the edge if the bridge collapses. Some reindeer has crossed before me. Probably the same morning. After a successful crossing I have to walk for 100 meters next to the ice-covered lake Nedre Steinbuvatnet. Nedre Steinbuvatnet (1500 m) in the Steinbudalen valley. 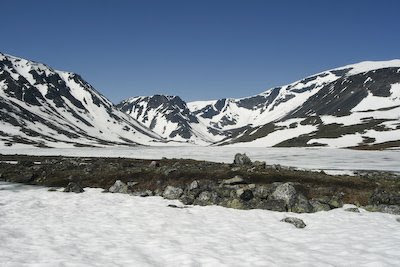 The mountains from the left: Ryggjehøe (2142 m), Steinbukampen (1997 m), and Glittertind (2464 m). I follow the snow fields to the eastern ridge of Mt. Ryggjehøe (2142 m). I have to walk in the steepest section, but then it's pretty flat right up to the steeper summit. I turn around at the 2000-meter level, and ski down. The weather is still fantastic. 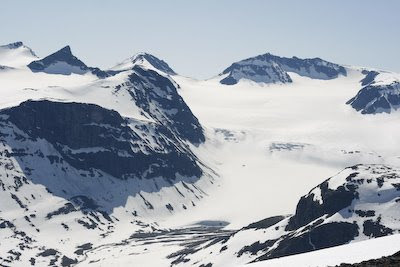 Veobreen and the surrounding summits, seen from Ryggjehøe. In the afternoon I walk down to the suspension bridge across the Veo river to take some photos. Later in the evening I see the first humans in about 48 hour. The road up to the Glitterheim parking has been opened and a young couple has walked the rest of the distance to stay in a self-service cabin for DNT-members. I wake up at six and start cycling at seven. There is ice on small pools of water, but already warm in the air. The sun is only below the horizon for a couple of hours each night. The road gets worse and the ride takes longer than expected. It's hard work to get through the soft wet gravel just after the winter. It will get better in a few weeks when motor vehicles has made the road surface firm. I arrive at Glitterheim mountain station around noon, and the average speed was only 8 km/h according to the bicycle computer. The place is closed and there is no one there. I haven't seen another person since Randsverk. I unpack my gear and start sorting through every thing. One pile for stuff that stays at Glitterheim, and one pile for stuff that is needed for the next part of the expedition - the ascent and descent of Mt. Glittertind, the second highest mountain in Norway. Bicycle related gear stays, and also everything related to camping and cooking. I will bring some needed clothes, snacks, drinks and skiing equipment. I'm ready to start around 12:30. There is a large snowfield that goes all the way down to the main building at Glitterheim, so I can put the skis on right away. 200 meters higher there is only large fields of rocks with a few small snowfields. I have to carry the skis along the trail for a couple of hundred meters of altitude. Skiing up the snow fields of Glittertind. Higher up there is snow all the way to the summit. The snow is wet and soft but compact, and not rotten - great for skiing both up and down. I get good grip with some old ski wax. 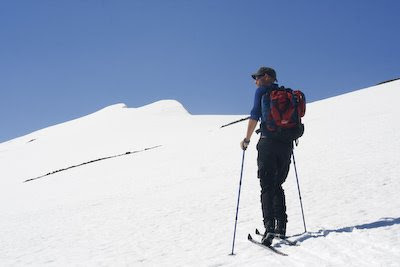 Skiing on the higher snow fields of Glittertind (2464 m). The summit is on the left. The photo is taken with tripod and timer. Just under the summit i leave the skis to walk the last 50 meters. The weather is clear and the views are stunning. 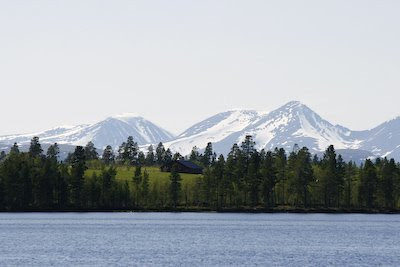 Hurrungane's razor sharp peaks are easy to recognize to the west and Galhøpiggen, five meters higher than Glittertind, is just across the Visdalen valley. It looks busy with several well trodden trails from Spiterstulen and Juvashytta. On Glittertind there are no other people, and no tracks other than my own. It's a great feeling to have this beautiful nature all to myself, but I wouldn't mind to meet at least one person coming up to the summit from the other side. It doesn't happen. Just below the summit of Glittertind (2464 m). I stay on the summit for about one hour. Then it's time for some telemark skiing. 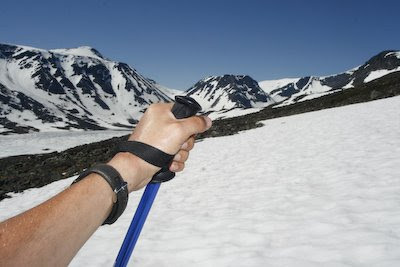 Great views of Jotunheimen National Park from the summit of Glittertind. 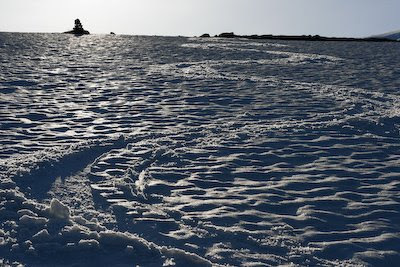 My ski tracks on the lower snow fields on Glittertind. The road down to Ringebu in Gudbrandsdalen is steep but in good condition. It drops from over 1300 meters altitude to around 200 in less than 20 kilometers. I ask about Jotunheimen at the government tourist info in Ringebu, and buy some food at the supermarket. People in town suggest that I choose the smaller roads on the west side of the river. The European highway E6 six carries a lot of heavy traffic. The choice is good. The road winds up and down between small farms in a beautiful landscape, but never goes really high up on the mountain sides. At Sjoa I turn left into theidyllic Heidal valley, and the road starts to climb toward the Jotunheimen area. 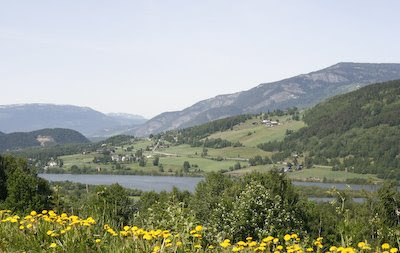 The landscape in Gudbrandsdalen near Vinstra. The road to Glitterheim starts at Randsverk at about 700 meters altitude. The road is a toll road, and unpaved. It's closed for motor traffic at the moment, but a maintenance truck delivers sand to improve the road after the winter. It looks like I will be alone on the road when they return to civilization at night. I cooks some food in the valley next to the little river. The road climbs slowly toward the village of Fuglseter, but then it gets steeper. A lot steeper. I need to use the lowest gear (of 27) and it's still really hard work. The road is wet and soft, and that doesn't make it any easier. 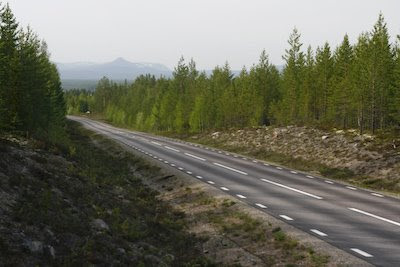 The wet Glitterheim road at Veofjellet. I'm exhausted when I reach the pass on Mt. Veofjellet. I camp with good views of Jotunheimen and mountains and forests to the east. Camp at Veofjellet on the way to Glitterheim. The landscape changes as I ride down toward the first larger valley in Norway. It's more dramatic, with steeper slopes, deeper river valleys and higher mountains. Even the roads are steeper and narrower. It does not feel entirely safe to go fast with the extra equipment strapped to the bike. The breaks get overheated and I need to stop for a while to cool them down. In Koppang I buy some groceries and ask about the mountain roads ahead. 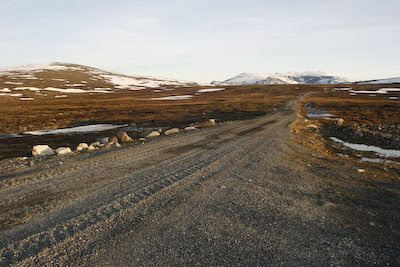 The first one is called Vinjevegen/Vinjeveien and is a steep winding dirt road that climbs high above the treeline, and ends at the second mountain road for the day - Friisvegen/Friisveien. Getting up above the treeline take several hours, but after that it gets easier. I pass little villages and hamlets. Some houses are old traditional summer huts where livestock was brought to graze. Others are small but modern cabins where Norwegians go during weekends and holidays. Small hamlet along Vinjevegen - an unpaved mountain road between Koppang and Friisvegen. Me at the tree line on Vinjevegen. A Dutch/Norveigian woman took the photo. She's driving north through Norway to see the country. Friisvegen is paved but is closed with a gate further up the mountain. It's easy to push the bike past the gate on the side, but I wounder what the reason for having it locked is. 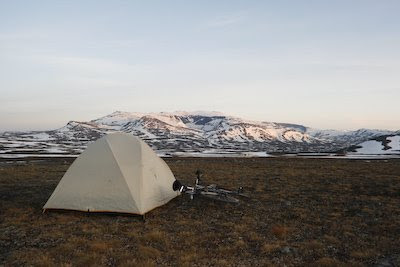 I cook some pasta next to a large snow field higher up, and camp with beautiful views of the Rondane Mountains in Rondane National Park. Friisvegen/Friisveien - A mountain road between Atna and Ringebu. The ride from Gränjesåsvallen to Idre is great fun. After a short steep climb there is a nice gradual slope down to the valley for almost 10 kilometers. No need to pedal and not too steep. Construction work is starting half way down the hills. There will be a new ski resort at Mt. 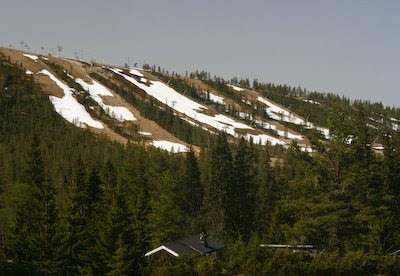 Himmeråsen - The Himmelsfjäll ski resort. I shop in Idre and continue toward the Norway/Sweden border further west. There are some hard climbs in the beginning but higher up the landscape is flat with lakes, bogs and hills in the distance. I buy some raisins and sweets in a small village shop just before the border. Norway has a reputation for being even more expensive than Sweden. 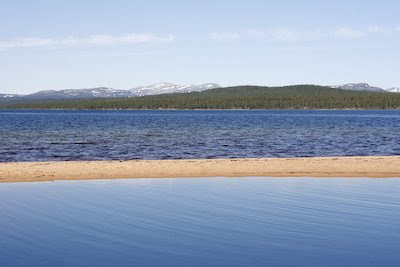 Beach at Lake Femunden with Femundmarka National Park in the background. There are great views of lake Femunden and the Norwegian mountains along the highway, and hardly any traffic. After Gröndalen I pitch my tent on a slope facing Mt. Sølen. A small farm at the Norway/Sweden border with Mt. Sølen in the background. A rest day. I do some laundry and cycle for a short daytrip to a lake. In the afternoon I walk up to the summit of Mt. Städjan. The weather is still great. The northern slopes at Idre Fjäll ski resort. 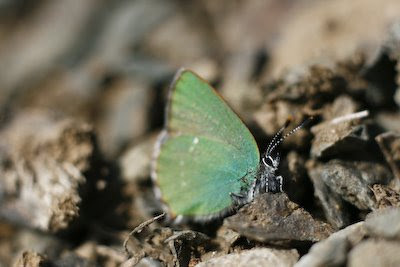 A green hairstreak butterfly (Callophrys rubi) near the summit of Mt. Städjan, 1 131 m.a.s.l. The Zorn Cabin at Gopshus is closed so I continue to Älvdalen and the ICA supermarket. The weather is still great. There is even a bit of a tailwind today so I may make it all the way to the cabin in Idre/Gränjesåsvallen. At Åsendammen the road winds away from the river to higher altitudes with views of Transtrandsfjällen (the mountains at the Sälen ski resorts). There are large snow fields above the treeline. 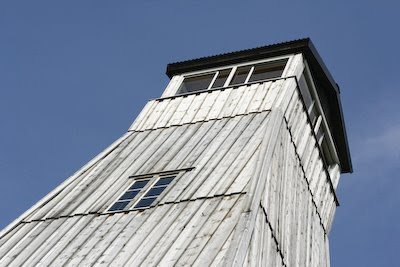 Further north I climb the Bunkris fire tower for even great er views of northern Dalarna. At Särna I buy some food at the OK gas station, and continue to Gränjesåsvallen. There is a 300 meter climb from the Österdalälven River, but the road is nice and dry even on the 7 kilometer long gravel section. National highway 70 with a view of Mt. Städjan and Nipfjället. At Smedsbo I talk to a couple of policemen, who wish me luck. Near Rexbo I see a big and beautiful butterfly that is usually hard to find - The Old World Swallowtail (Papilio machaon). It travels over large areas and rarely settles down for long. This one also flies off after a few short stops on dandelion flowers. Just minutes later I see another one on a hill along the road. It stops at flowers too, but tend to come back to the hilltop over end over again (hill-topping). I get my big lens out and manage to get a few shots. 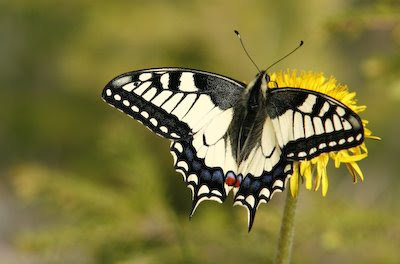 The Old World Swallowtail (Papilio machaon). , and stop to do some shopping on the island of Sollerön just before Mora. From the Island I also see the first snow. It's the remains of the ski slopes at Gesunda. I eat a burger in Mora and camp at the hydro power station at Gopshus, after making the wrong turn in Våmhus. I planned to cycle on the smaller road and get back to highway 70 at Rot. Instead i got right back to the busier road after a short and unnecessary detour. That's punishment for being lacy when it comes to navigation. The Haglöfs Factory Outlet is a nice store, but prices are not that low. I do some shopping and eat a kebab lunch special at the fast food place next door. The weather is great and it's getting warmer during the day. 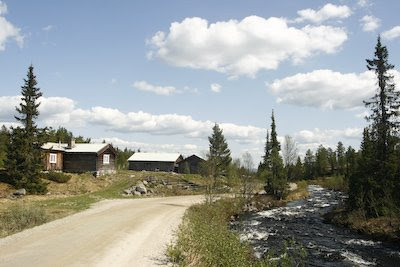 I ride past old industrial buildings in Avesta and continue on a small road through the village of Snickarbo, on the west side of the river Dalälven. After Hedemora I head toward Falun, but turn right again just after crossing the mighty Dalälven. The countryside is beautiful here with old traditional farm houses, fields, and rolling hills in the distance. Much better than the big highways that just runs through large forests, far away from the old villages. In the evening i meet a lot of cyclists on race bike. They're having a local competition and I start talking to a Swedish/Syrian cyclist at the start/finish of their race. 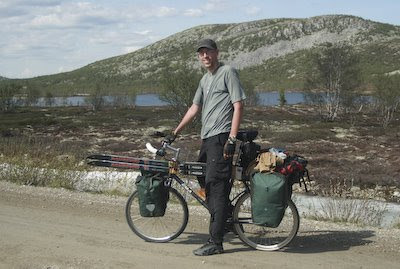 He's planning to cycle from Dalarna, Sweden to Syria with his race bike with only a small daypack with spares, tools, and extra clothes. He feeds me and wants to hear more about my travels in the region. We talk for an hour before I head on to find a place to camp for the night. Girls having fun on the river. Before Enköping I decide to go on smaller roads. The highways 55 and 70 are too busy and there is even a stretch of proper motorway where cycling is prohibited. Finding good alternatives is not easy. I end up riding quite a few kilometers extra on winding small roads, sometimes without asphalt. 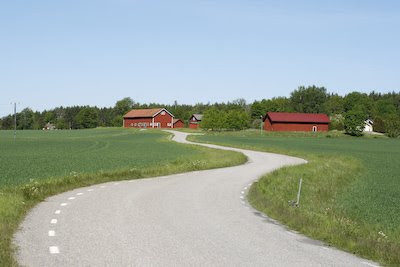 After crossing the last bridge across lake Mälaren, I ride past the villages of Teda, Björksta, Kärsta, Tortuna, and Sevalla before I cook lunch on a small meadow next to the road. The plan for the day is to get to the road through Sätra brunn and Salbohed and camp before Avesta where I will look for a new Goretex jacket at the Haglofs Factory Outlet. There is a tiny road on my old map that would get me up on highway 56, and on to the Sätra road. I go through Vad where the road should be and end up at a farm. Two guys are building something there and they're not sure if there is a road anymore. They show me on to a small track that leads to the nearby forest. They suggest I give it a try. The path slowly disappears, but I don't want to turn around and cycle a long detour. 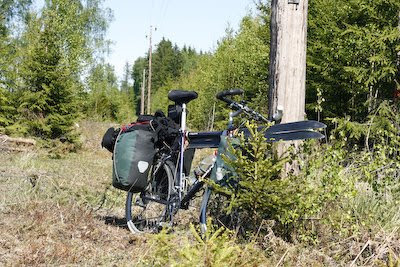 I end up pushing my bike through a small forest area, a forest clearing and a small bog before I get up on the national highway. I camp near highway 70 before Avesta. I had most of my gear packed the night before departure, but I had some experimenting to do with fixing the skis. If they're tied too low they get stuck in the front panniers while turning. If they are positioned to far back the bindings get in the way of my thighs. I found that there was only one option for how to place the skis (see photo in previous blog post). I filled up water and fuel bottles and left around noon. The weather was perfect. After 25 kilometers I chose a smaller road in the countryside. At Kattnäs I made the first mistake. I took a chance on following a local bike trail, but it didn't go where i guessed it would go. I ended up on the west side of lake Klämmingen. No big deal. It was also hard to find the right way in Åkers styckebruk, and in central Strängnäs. I cooked some macaroni after crossing the first bridge across lake Mälaren, and camped just before the second one. The first camp site on an island in lake Mälaren. Cycling with skis tied to the frame was a bit odd at first but I soon got used to it. I had to readjust the straps at one point, and going fast on bad bumpy dirt roads did not feel safe. 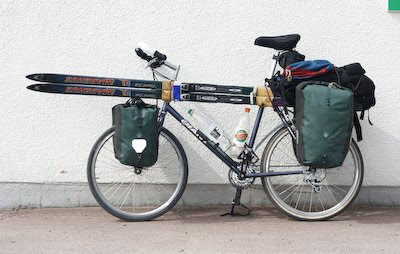 A few weeks ago I read a discussion on how to carry skis on a bicycle. That got me triggered, and I started planning a bike trip with full camping gear and skiing equipment. 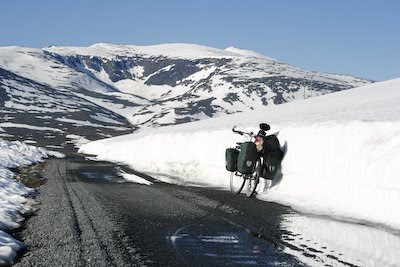 The plan included cycling from Sweden to one of Norway's highest mountains, and then ascend and descend it on skis and return to Sweden by bike. In the next few blog posts I will write about the preparations and the adventure itself, and include some photos. The preparations: I start the planning process by checking snow conditions in the Norwegian mountains. 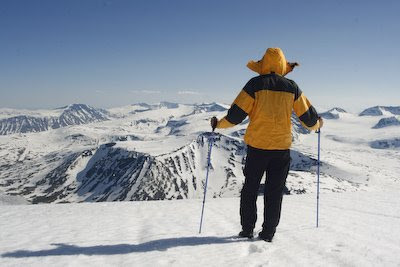 The western mountains are known for good summer skiing so, there shouldn't be a problem to find snow. Senorge.no is great for detailed information on snow and weather in general. 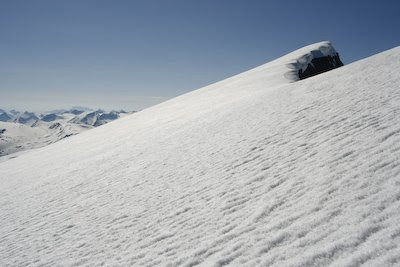 I found that large areas in Jotunheimen (and further west) had four meters of snow or more. The trick is to fix the skis to the frame so that you can turn the handle bars. This may be difficult on a small frame. The skis are Nordic style touring skis with edges. They are not ideal for going down very steep slopes or at high speeds, but light and easy to ascend with (with skins or ski wax). Front panniers or break wires may get in the way. I keep boots and poles in the backpack on the rear rack. The rest is my normal equipment (camping and cooking gear, clothes, camera equipment, food, ...).